This is the story of a guinea pig, Christmas, and how a six-year-old’s life lesson has to do with rabbits. Christmas was a big deal growing up but our financial situation was always modest so any presents we received were a Really Big Deal. When I was seven years old my greatest desire was a Trapper Keeper with kittens on it from Revco, the local drug store. When I woke up that Christmas morning and saw that Trapper Keeper… oh! I just couldn’t get over how lucky I was! I may have been exceptionally excited about the Trapper Keeper because I could remember my gift from the previous year. As a little six-year-old, still believing in Santa Claus but realizing that Mommy and Daddy were the financial backing of other gifts, I woke up to a stocking filled with navel oranges, life savers, bubble gum, and a medium-sized cardboard box. When I unwrapped that cardboard box, there was something amazing inside! A guinea pig! It was white and brown and very snuggly! It was mine, all mine! Oh, the joy! I held that guinea pig on our cream-colored velour sofa and gave my heart to it completely. I loved that guinea pig, we were meant to be fast friends. 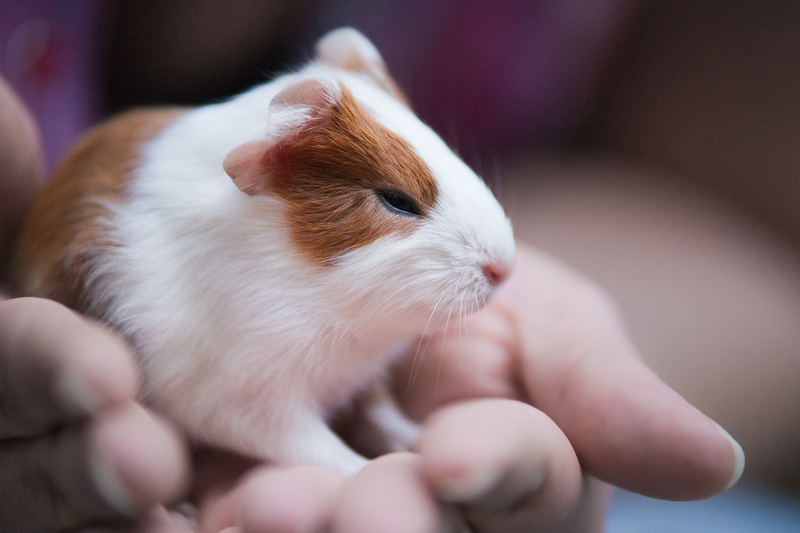 The guinea pig was so willing to sit calmly on my lap! It was lovely with its pink nose and beaded eyes. I couldn’t have been happier with my guinea pig! Right up until the moment I realized it wasn’t breathing anymore. Yes, folks, my parents gave me a guinea pig on Christmas morning and by lunchtime on Christmas day… it was dead. My mom assured me they did not get it on sale and we travelled an hour away on Christmas day to another city to pick up a new, very live guinea pig from the breeder. I remember being depressed about the new guinea pig. I had really loved the first one so the replacement was just… a replacement. It turns out the guinea pig was separated from its mother too soon in order to send it home for a Christmas-morning reveal. I had forgotten this story until today (proof the scars we receive as children really do heal). You see, we are now in the rabbit breeding business and there’s a gentleman who would like a rabbit for his child for Christmas… but the baby bunnies won’t be weaned and ready to go to their new homes until the first week of January. Even so, I almost caved and told him we’d push it and let the babies go home on Christmas Eve… until I remembered my guinea pig story! Nothing puts a damper on the Christmas spirit quite like a dead animal. I told the gentleman we’d provide a professional quality photo to wrap for the gift and visitation rights instead. And that, my friends, is the end of that. Did you ever get a heartbreaking Christmas gift? What happened?